The original church was a corrugated iron structure known locally as the ‘Tin Tabernacle’. It was erected in 1904, across the road from the present building. It soon became obvious that a more solid structure was required and the prestigious church architect, Sir Ninian Comper, was commissioned to draw up plans. The original plan to replace the ‘Tin Tabernacle’ was the first of two designs which Comper carried out, the first prior to the Great War, the second, the present church. 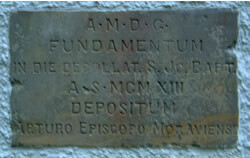 The foundation stone was laid in 1913 but building was delayed due to the Great War; however, after the War funds were insufficient to complete the church to his original design. Sir Ninian modified his plans and the result is this beautiful little church with its groin vaulted ceiling and simple white interior, referred to by the architect as his ‘little gem’. The building was completed in 1930 and consecrated on 26th July 1931. Comper’s lifetime interest was the liturgical significance of the altar, and all his churches are designed ‘from the altar outwards’. St John’s, though uniquely small and simple, is typical of this. 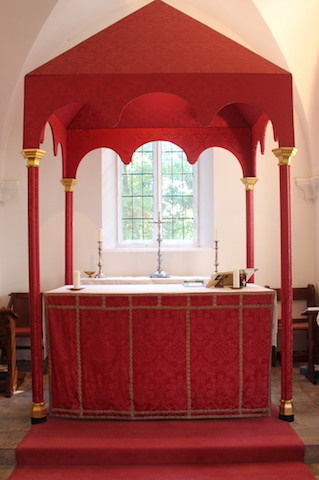 The rose damask baldachino (the canopy above the altar) and the altar frontal were renewed in 1982, woven by Pallu & Lake, and expertly copied from the architect’s original colour and design, which includes Sir Ninian’s ‘signature’ of a strawberry. This was often included in the corner of the many stained glass windows he designed but was not possible in the windows of St John’s, which are all of clear glass so that they do not interfere “with the glory of the surrounding trees”. The organ, which replaced the harmonium, was built by Christopher Dickens, M.A. (grandson of Sir Charles), and installed in June 1982. It was financed partly through a legacy left by Mrs Agnes Barrett-Ayres, widow of the Revd Canon F.G. Barrett-Ayres, Priest-in-Charge 1937-45, and partly by a donation from the Grant of Rothiemurchus family and Trustees of the Charitable Trust of the family of Lady Mary Grant of Rothiemurchus, wife of the founder of the Church, and who was for many years the Organist in the original Church. Donations were also received from members of the Congregation and others. The natural wood case was chosen by Mrs Mary Tindall, Architect. Above the organ is the Grant family motto: “In God is all my trust”. It is dedicated to the memory of Lady Mary Grant of Rothiemurchus and The Revd Canon F.G. Barrett-Ayres and his wife. Their son, Reginald, at one time Head of the Music Department at Aberdeen University and Organist and Choirmaster of King’s College Chapel, Cambridge, was much involved with the design, and played at the Dedication. It was rebuilt in October 2000 by A.F. Edmonstone who assisted Christopher Dickens with the installation in 1982. 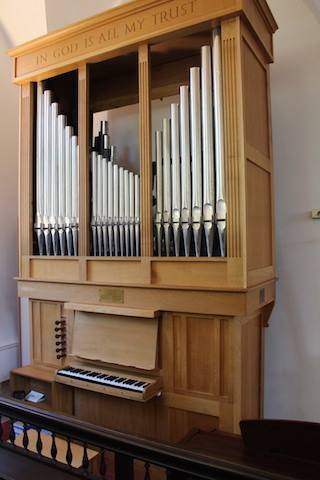 The £4000 cost was met by donations from the Congregation and particularly from Mrs Mary Todd and her Mother in memory of her husband Geoffrey, at one time Organist of the Church.